TORONTO -- After leaking 17 goals in their last three home games, the Toronto Maple Leafs tightened up on defence in their return to the Scotiabank Arena on Saturday after a three-game absence. “Obviously our goalie was huge but we did a lot of good things too,” said a relieved Rangers coach David Quinn. “Listen, it's one of the most dangerous teams in the league and I thought we did a real good job in a lot of areas and finally won an overtime game,” he added. The Rangers (29-32-13) had lost the last five times - and 10 of the last 11 - the game had gone beyond regulation time. Georgiev, a second-year Bulgarian-born goalie, had a career-high 55 saves - second-most in a regular-season game in Rangers history - in a 4-1 win over the visiting Leafs on Feb. 10 (his 23rd birthday). That included 25 power-play shots. “(You) just keep going ... It's eventually going to go in. If it's not tonight, it's going to be tomorrow. 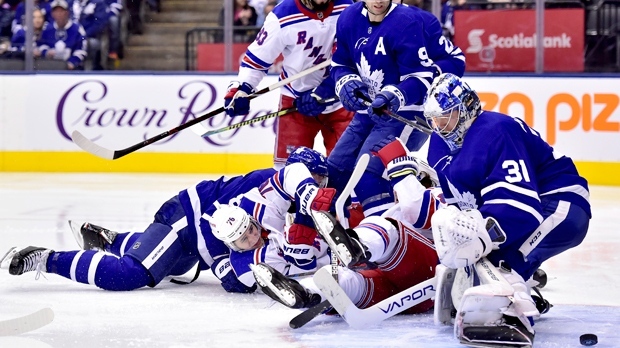 If it's not tomorrow, it'll be the next game,” Matthews said philosophically. “He had some great looks, really good looks,” said Toronto coach Mike Babcock.